I have gotten several humorous, uncomprehending e-mails asking why I have created an extensive amateur astronomy website that doesn't sell anything and is completely free. I have to admit the reason it was originally put together was kind of selfish - I travel a lot and I wanted a site on the web where I could have access to all of the astro formulae and other data that was of interest to me without having to lug books through airports. Then I decided to tackle assembling a Member's Handbook for our local astronomy club and thought I should put all of that info on line. Next came a couple of online introductory astronomy classes... and it has grown from there. I enjoy exchanging e-mails with site visitors who are always giving me great suggestions on what to add to this site. I only spend cloudy nights working on the site. I like to go out and observe! You can usually find me on the top of Mt. Pinos in Southern California at New Moon during the summer months, and at Saddleback Butte State Park or Red Rock Canyon State Recreation Area during the winter months. Come say hi if you get the chance. I have received many e-mails asking me why I put all of this information online. My answer is that the night sky is free, and interest in amateur astronomy goes back into the dawn of human history. I wanted to put the reference material online that I had to hunt for across many, many references or talk with several experts. My introduction to amateur astronomy was through the benevolence of my Uncle Gary, who offered to send me a telescope - if I would pay the shipping. He called me up about a week later and said that shipping had come to $100, but left me guessing as to what kind of telescope could cost that much to send! A week after the call, I got a large box in the mail with a BIG tripod, and a whole bunch of astronomy books. The next day I got another huge box and inside was a Celestron C-8 Schmidt-Cassegrain telescope. I was like a kid on Christmas morning, I had never gotten a gift like that before! I didn't know anyone in astronomy, and although I had a minor in college in astronomy, I didn't really know much about how to find anything in the sky! After making every mistake that's possible when a complete newbie starts out in the hobby and doesn't ask anyone for help, I decided that looking around for a local astronomy club might be a good idea. I found the Fort Worth Astronomical Society. Three people there really took the time to introduce me to the night sky without making me feel like a complete idiot. I thank John Bartels, Bob Newman and Becky Nordeen for taking the time to explain how the sky really works, for starting me on the quest for my Messier Certificate, and showing me how to properly care for the equipment. Because of a work transfer, I moved from Ft. Worth, TX, to Lancaster, CA. This area is called California's "High Desert" because of it's altitude and 1.5" of annual rainfall. The first night out, I realized that the night sky from my back yard in the desert of CA was better than the Fort Worth Club's dark sky site - I knew I was going to be spoiled. I quickly joined the local club called the Antelope Valley Astronomy Club, finding a couple of members that enjoyed telescope making and deep sky observing. It was here that I was introduced to observing from incredible sites like Mt. Pinos, Red Rock Canyon State Park and the Mojave National Preserve. High altitude air that is dry and steady is pretty addictive to a budding amateur astronomer. I bought a 10.1" Coulter Dob from a neighbor in my quest for bigger aperture, but the mirror had some significant astigmatism, so I didn't keep it long. I realize now that my Celestron has great optics. It wasn't one of the "Halley Comet" scopes and has the starbright coatings. 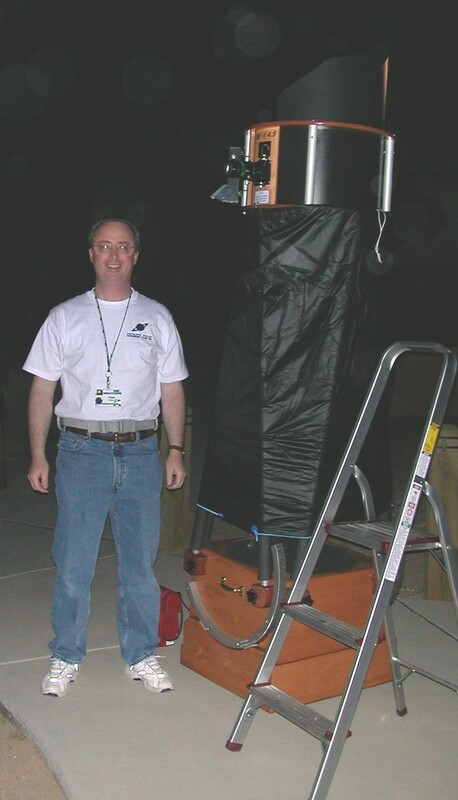 I then bought a Meade ETX-70 with the digital 495 hand controller in a spectacular deal that Astronomics was running for a week that included the telescope, tripod, eyepieces, and software. It has fairly good optics, but the focal length is only 350mm so you don't get much of any type of magnification on objects like Saturn, Jupiter or the Moon. It's electronically controlled though. I think it's fun to see the scope slewing around after I have spent so much time learning the sky star hopping through the constellations! I have used this as a public Sun viewing telescope, and it has produced nice views of the Pleiades, Beehive Cluster and comets - all wide field of view objects. It's also great for wildlife. Sometime around the time I was looking to purchase the 10.1", I realized that my interest centered around deep sky objects. There is something about searching out faint galaxies, clusters and nebulae that lets me project my mind out into the cosmos - thinking about what it must be like to visit these places, to see these objects up close from a vantage point much closer to them. Anyway, that's where my interest lies so I set about heading towards equipment that would allow me to see these 'faint fuzzies' better. Forward in time about 7 years... I had finally saved up enough money (I thought) to get the telescope that I wanted. I had been lucky enough early on to be up on the top of Mt. Pinos one night when a guy with a 20" Obsession telescope arrived at the same time as a guy with an 18" Obsession. I got to observe the 'ease of set-up' differences between the scopes and then I made a deliberate comparison between the image brightness and contrast, eyepiece heights, and their convenience. If you are stuck in your decision for any astronomical equipment, I strongly encourage you to go to a star party and try before you buy. I became convinced that I wanted the 18" for the reason that it was the largest aperture that I felt that I would use all of the time. For me, the 20" was just too large to handle conveniently. I bought the Obsession, spending a bit more than I had intended because I decided to get the better optics. Dave Kriege at Obsession offered me service that I have NEVER had at any other astronomy company that I have dealt with. From the time of order until the time of receipt of optics was three days! The telescope arrived just two weeks later! I highly recommend Obsession Telescopes. I have found that I can set up the 18" in the same time it takes me to set up the C-8 (5 to 10 minutes), but pack up time takes a bit longer, about 20 minutes. The weight is only 25 lbs or so at the wheelbarrow handles. My son and I made a set of ramps to load the telescope into the back of our minivan, and it's no problem at all to load and unload despite back problems. I am putting in various modifications into the scope to boost the already excellent contrast even further. I just made a Kydex light baffle for the Upper Tube Assembly and am working on a baffle for the lower box, behind the mirror. I have added a 2" filter slide from Roger Greene at Astrocrumb which also helps baffle the light into the eyepiece. I met longtime Obsession expert Howard Banich (20" #038) at RTMC this last year and he showed me about a dozen great tweaks that I will be trying out over the next few months. What a fantastic instrument. I can also see an equatorial platform sometime in the future to facilitate something I am interested in - taking spectra and maybe finding (verifying) a planet around another star. Celestron 12 x 80 4.5 degree binoculars on a parallelogram mount modified extensively by Terry Pedroza. Rock solid on a self-modified Bogen professional tripod (Very stable), low power views of the cosmos. Meade ETX-125 with Autostar Bought used, but in great working shape after being super-charged. Portable enough for grab- and- go. Very good optics on this particular scope. TeleVue Pronto on Alt-Az Mount. My "Grab and Go" scope. Obsession 18", f/4.5, 96% Strehl ratio. Eyepieces: Ethos, Nagler and Panoptic, a few Super Plossls. 2" Galileoscope - cost $15 - Lots of fun! Enjoy the astro-tom.com website, but if it's a clear night, why don't you turn off the computer and go outside ?!! 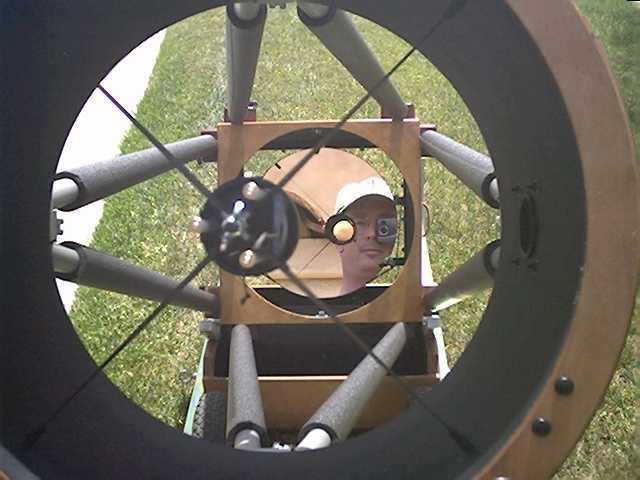 View Looking Down The Center of the 18" Scope, before the installation of the filter slide and bottom mirror box light baffle. Public Star Party at Prime Desert Woodlands, Lancaster, CA, March 13, 2004. Hundreds of Cub Scouts, Boy Scouts and the general public got their first view of Saturn and the Orion Nebula by climbing the ladder.